Temporary Fencing Hire. Heras Fencing. UK Delivery. The construction trade loses £1m a day in theft and vandalism on site. Temporary fencing allows the trade to protect tools and equipment from opportunist theft. Also protects the public from site works. The digger behind the fence in this picture is not included in the hire rate! Project security and safety are always a top priority for construction companies and their crews on building sites right across the UK. While it would certainly be ideal to have an around the clock security guard, CCTV or automatic system to prevent theft, it is very rarely an equitable option. Securing your development site, along with the costly equipment, tools and supplies, can be accomplished by utilising temporary mesh fencing. 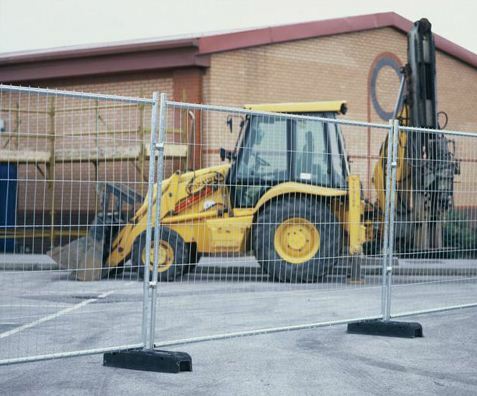 Temporary Heras fencing hire is an affordable solution to safe-guarding heavy equipment from vandals, and the smaller tools from would-be thieves. Revenue losses due to theft are an on-going problem with industry losses running into the range of £1 million per day. No project budget can overcome the cost of stolen supplies and tools needed to complete the construction assignment. Another advantage to Heras fencing off your construction zone means you are taking steps to protect the public from potentially dangerous work areas. This public safety consideration may save you a major setback should an innocent pedestrian wander into danger on the site. Heras or harris Fencing erected to limit site access will solve this potential problem. Secure fencing will also deter youngsters from using the site as a playground especially when it is not in use. It means that you will adhere to health and safety regulations while offering safety and peace of mind. Fencing hire doesn’t have to be expensive. Temporary fencing hire including Heras fencing hire is available from Lakeside-hire. No matter how large or small your fencing needs might be, Lakeside-Hire can provide fast, dependable next-day service. Easy-to-erect, sturdy and secure fencing delivered to your location in our ever-expanding delivery area. You can surround your entire work site, or use as an enclosure for equipment and tool areas. Temporary Heras fencing panels inc ground block and coupler – £5.00 a week.